Media, in general, can be described in simple terms, like a movie was good, the book was sad, or the Internet is informative, and how did we ever live without it! Psychologists, on the other hand, look at media from a theoretical perspective by bringing social cognitive theories to media (which suggests that individuals are proactively involved in their development, and can, therefore, exercise control over their feelings, thoughts, and actions). 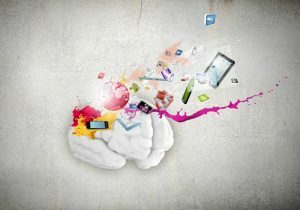 In other words, Media Psychology focuses on the relationship between human behavior and the media. It studies the interaction between individuals, groups, and technology, and tries to make sense out of this synergy. As recently as 1950, when television was becoming a popular form of entertainment, media psychologists became concerned about children and their enthusiasm of television viewing and the impact, if any, on their reading skills. Later psychologists began studying the impact of violent television viewing on children’s behavior, and if they were more likely to exhibit asocial behavior. Dr. Sarah Vinson, a board-certified child and adolescent psychiatrist, says that media continues to consume an ever-growing part of people’s lives. People, and young people specifically do not have the face-to-face interaction they need in order to learn social skills, and more and more children are having a difficult time interacting with others, which can lead to unsociable behavior. Studies on the impact of media led to the formation of the APA’s, Division 46, the Media Psychology Division, in 1987. In 2012, the APA’s Media Psychology Division 46 became the APA Society for Media Psychology and Technology (with their own Facebook page, which seems appropriate). This division is now one of the fastest growing in the APA and has advanced to include new media studies, such as cell phone technology, the Internet, and computer and console gaming. According to the APA, Division 46, “Media Psychology focuses on the psychology behind media and technology use and impact” – and as media technologies evolve, so will media psychology, and too, the demand for media psychologists. But, because the field of media psychology is so new and dynamic, career paths are difficult to define. Entrants into this field have both the thrill and the burden of defining its evolution. As each new technology is introduced, media psychology morphs to meet the cognitive and humanistic components of the user’s experience. What psychologists do know is that technologies are everywhere, and people of all ages use technology. And since technology is here to stay, older people worry about its use by younger people, and everyone worries if all of media and technology is good or bad, or (most likely) somewhere in-between. It’s also important to consider how the expansion of new technologies influences different markets. It’s not surprising that tech-savvy markets, such as Seattle, San Jose, and San Francisco top the list for many new technologies. However, in the past 18 months, cities like Pittsburgh, Miami, and Detroit, saw double-digit gains in smartphone, subscription video-on-demand, and tablet penetration. Still, media isn’t just about video games, blogs, YouTube, Twitter, television, printed media, or radio. It also encompasses psychologists appearing in the media, such as Dr. Phil or Dr. Paul Weston (played by Gabriel Byrne) in HBO’s “In Treatment” and their influence on our thoughts and actions. It can also take into account professional psychologists using media to advertise their private practice or services. In fact, over the past ten years, advertising by professionals has jumped nearly 63-percent, and continues to gain acceptance among psychologists, doctors, dentists and other professionals who use social media as a means to advertise, gain referrals and feedback. Many maintain a Facebook page or a blog. They may tweet, or make use of an app for scheduling appointments. And, as nearly 95-percent of clients look online first (trumping referrals by family or close friends) for a psychologist, having a presence can energize, or reenergize a private practice. One area that is getting a lot of attention, both positive and negative, is video gaming. Psychologists have varying viewpoints, but all agree that gaming is absolutely having an impact on children, teenagers, young adults, and even people well into their 70’s. As far back as 1940, video gaming was challenging players with games like chess, tennis, and blackjack, and even US military wargaming. Then, in the early 1990’s, real-life strategy games and first-person shooting games, like Doom and Mortal Kombat prompted US Senate hearings on video game violence. In early 2000, Massively Multiplayer Online (MMO) gaming took hold, with World of Warcraft (among others). As MMO gaming creates virtual universes, it redefined how gamers play, learn, and even relate to each other. Mobile games like Farmville and Angry Birds played on platforms like Facebook and iPhones, saw millions of people who had not previously considered themselves gamers, burning time at work, on the road, and at home. The controversy about game violence, bloodshed, and the fact that gamers spend hours playing games not only riles the video game industry but parents and psychologists alike have raised questions about the potential for violence, since the gamer is an active participant and not merely a viewer, as with television. Although some studies have shown an increase in violent tendencies in children and an increase in violent behavior, other studies have debunked these claims. But, as more than 90-percent of all US children regularly play video games (in some form) and 97-percent of youths, ages 12-17, the question remains – are video games good, bad, or a mix of good and bad? Those who stand to make the most money in the industry, i.e., game developers and game console manufacturers, for instance, will argue that if violent video games cause aggression, violent crime rates in the U.S. would be increasing instead of decreasing. However, in a 2001 Report of the Surgeon General on Youth Violence, violent crime perpetrated by youth is increasing (or certainly not decreasing). Exposure to violent games is also increasing, as are violent video games. Another question that has been raised – are our youth becoming more and more desensitized to violence through gaming? Notwithstanding, you only have to look at the evening news or other late-night television show to understand that video games are not the only, or even primary factor contributing to this desensitization, or to youth violence. The National Television Violence Study, a three-year assessment of more than 3,000 programs a year, found that a steady 60-percent of programs across twenty-six channels contain some physical aggression. But beyond the violence of video games (as not all, or nearly half of all games are violent), what about the anti-social behavior that is typified by gaming? Go anywhere today and the view is the same, people sitting quietly, head bowed, fingers tapping while playing, texting or emailing on their phones or tablets. Conversation is virtually unheard. Yet many people will argue that technology and the media allow us to instead share our experiences, become more socially active, and build relationships with people across the world through gaming. Although the jury is still out on whether the obsession with gaming will, in fact, leave people without the ability to converse socially, this much is true – according to the Personality and Individual Differences, a peer-reviewed academic journal published 16-times per year by Elsevier, people who constantly (more than 95-minutes a day) play games, text, or email on their phones are more prone to moodiness and temperamental behavior, and are therefore less likely to engage in conversation. On a more positive note, video gaming does have its benefits. Dr. Pamela Rutledge asserts that there are many benefits for people who are shy or withdrawn. Gaming, as well as all social media, allows people to connect with other people around the world. Media can add creativity to our thinking, and it allows us to explore and become actively involved without the fear of rejection. And while no one advocates spending hour after hour gaming, games can improve a person’s’ self-efficacy, boost their cognitive flexibility and self-control, and build social connections. Teaching with video games (game-based learning) is an emerging tool for motivational and engagement learning in rehabilitation facilities, in schools, day cares, and in special education classrooms. Teachers have found that games not only engage students, but they also inspire learning. It’s been shown that even after students have been dismissed from the classroom they continue to solve a game’s puzzles and problems. In that way, students become part of the story, rather than sitting back listening to a lecture. Games can show students how better to deal with success and failure (in order to win at many games, you sometimes have to fail first). Games allow students to work together, organize, and function as a team. Studies have also shown that with the use of certain games in the classroom, students can encourage and inspire other classmates, which in turn adds value to their lives, and improves their happiness. Researchers at the Mind Research Network found that the mental workout gained by playing Tetris helped gamers develop a thicker cerebral cortex when compared to people who had never played. Likewise, a study at the University of Rochester discovered links between playing first-person shooter games and improved decision-making and reaction times. Over the past ten years, Facebook has become one of the most popular online sites ever, suggesting that it offers things we naturally crave – acceptance and companionship. And on the surface, that may be true. However, just like with any other online frenzy, Facebook can (and often does) invoke psychological issues, many of which may go unnoticed for weeks, months or years. A recent study found that heavy Facebook users experience a decrease in subjective well-being over time. Many users become depressed with their lack of success, or they may envy a friend’s successes more. Maybe one person’s Facebook profile doesn’t have as many likes or followers, and so they feel inadequate or unequal. Some people become jealous of others, unhappy with their current circumstances, and ultimately fall into an on-going depression. Yet, we are sucked in by Facebook, and there’s a psychology behind that. There have been numerous studies regarding why we log on. Facebook is said to tap the brain’s pleasure center; the more we log-on and receive positive feedback, the greater our use. Another study found that physiological reactions, such as pupil dilation happen when browsing Facebook. These reactions evoke a feeling of happiness, like when we learn and master a new skill. We identify with other people on Facebook by “liking” certain posts – sometimes more than once or twice a day and thus become connected with another person’s interests and their friends, which helps grow our optimism and contentment. You use Facebook so much that it has had a negative impact on your job, your family life, or your studies. Ironically, the DSM-5 has a Facebook page with over 188,500 likes as of the publishing of this article! As a footnote, Facebook is not the only form of social media that draws people in like a magnet. Twitter, Instagram, YouTube and many other such sites entice us to keep coming back for entertainment, relaxation, social interaction, and more. Boredom - People have grown so accustomed to over-stimulation that when they are bored, they begin scrolling. Or, they feel insecure in the fact they have nothing to do, so they begin scrolling. Positive reinforcement - People have grown accustomed to positive reinforcement with "likes" and "follows" being the measuring stick. This can feel great, and it reinforces the behavior to stay on social media and continue trying to get more "likes" and "follows". Instant gratification - I see this happen at the dinner table all of the time, a family gets into a debate about who the actress was in a movie, so one of them whips out there phone to Google it, and all of the sudden that person has been on the phone for five minutes because they got distracted by other things. We like having all of the answers at our fingertips, but it often leads to disconnection on other levels. As a society, on average, we spend nearly seven hours a day as ‘couch potatoes’ planted comfortably in front of the television, or in front of our computers downloading the latest movie on Amazon. A study by ThinkBox explains that television satisfies our emotional needs: for comfort, to unwind, to escape, indulge, or simply for the experience. Companies advertising their wares spend millions of dollars a year to promote their message(s), and advertising companies spend many months deciphering data about what people want or need in order to keep us hooked. In the 1950’s when black and white images flashed over very small television screens, psychologists began noticing how a simple television show could impact and influence the behavior of viewers. For instance, the way women were portrayed on television. Maybe less so today than in the past, women on TV were generally thin, which in turn introduced a stereotype decreeing all women should be thin. The psychological issues this has caused, such as bulimia and anorexia, abound even today. But there is no arguing that TV shapes how we view people and view the world as a whole. It influences what we buy, how we feel, why we make the choices we do, and even shapes what we believe. Case in point, years ago it was uncommon to show African Americans on TV. Not showing this demographic on television, in essence, made them invisible and led to apathy towards this race. Thankfully, we can learn from our mistakes. One aspect of television that has seen enormous growth in recent years is that of “Reality TV" where real people are continuously filmed, is designed to be entertaining rather than informative. Psychologists ask, are we so unhappy in our own lives that watching the perceived reality of other people’s lives feeds a need; either to feel better in our own skin or to realize others also struggle as we do? The Internet Ruined My Life – a new reality television show airing on Syfy January 2016, exposes the unexpected pitfalls of living in a social media-obsessed world. It follows the ‘tweets’ and ‘emails’ posted by individuals, and how their “instant” actions have altered their lives. However, reality TV shows in which we have a say in the outcome, as with American Idol or Dancing With The Stars, puts the audience in control of the results and gives viewers a stake in the outcome. Research has shown that we watch reality TV because we love the drama and glamour that’s portrayed through shows like Keeping Up With the Kardashians. But, after a long day, it’s possible that the real reason we tune into other people’s reality is simply for pure entertainment. Newspapers, radio, and television programs broadcast the news 24-hours a day, 365 days a year. Therefore, it is nearly impossible to avoid bad news and the negative influence it has on our lives. School shootings, terrorist attacks and airplane crashes, as well as the incessant onslaught of violence from all forms of media, can have long-lasting psychological repercussions and ultimately lead to thoughts of our world falling apart, stress and anxiety. It’s frightening to note that nearly two-thirds of all TV programs contain some physical violence, according to Nielsen Company. Our brains are hardwired to focus on the shocking and horrific. And much like our obsession with traffic accidents and chasing ambulances, negativity on television is difficult to ignore, and it can significantly influence how we view our lives and the world. Negative TV can lead to negative thoughts, leading us to view our lives as more distressing than they actually are. Some research has even shown that viewing traumatic images on the news can cause PTSD-like (post-traumatic stress) symptoms. In 2001, people were glued to their TV sets when terrorists took down the Twin Towers in New York City. Studies later showed that viewing these images of 9/11 triggered fear and reduced confidence in our nation’s security. Interestingly, the research also showed that the degree of our fear was directly correlated with the amount of time spent watching the news. Psychologists have also noted that this exposure to graphic violence, and to negative media can either cause an over-sensitization, where we become more sensitive and pessimistic or can lead to desensitization, in which we are actually numb to the effects of violence. (As mentioned, this has also been observed in those who have been repeatedly exposed to violent video games). Unfortunately, this pessimism can lead us to ignore the many things that are positive in the media, and in the world. We only have to look at the many upbeat posts from friends and family on Facebook, the news story about a hero that pulled a young woman from a burning car, or a Tweet about a new cure for AIDS to know that the quality of life for millions of people has actually improved – despite what the headlines suggest. There is no doubt that media and psychology have made major contributions to our society in the past century. And although still in its infancy, Media Psychology continues to tap into the potential for use in areas, such as science, business, entertainment, advocacy, public policy and much more. Understanding the relationship – both dynamic and interactive – between media and society is key to its further development, and its positive) influence in our lives. As media psychologists continue to study the phenomenon of media, the implications of media persuasion, how media influences our interpretation of information, our development, and our differences, we will begin to better understand how to use and develop technologies to communicate, connect, interact, discuss, and discover new things. As the field of media psychology changes each time there is an update to a mobile app, psychologists must not only look at the work that has been accomplished, but must also look at the work that needs to be done going forward. Learn more about a media psychology degree and how to become a media psychologist.